Good morning, everyone! Here I front-porch sit, playing hooky -- again -- from church, and feeling very guilty about it. Still, it's been a bit of a week due to illness and workmen in the house. The peace of a slightly damp but sunny morning out among the clover, the migrating songbirds, and the breakfast-hunting squirrels, the memory of a radio sermon in my mind, and the sewing box beside me are restoring health and energy. The lilac project goeth strong. While I await the Eterna silk thread to arrive so I can complete the embroidery on the lilac sleeveless spencer, I've been making up the lilac petticoat. You first met it last fall in Making the Wrap-Front Dress Do Double and Triple Duty, and again in Lilac, Lilacs, and a New Look. As with many of my projects, it is going through several iterations over time. This summer it is just a plain petticoat, accented only with silk stitching at the hem. Sometimes mantua makers and seamstresses sewed seams in contrasting colors to add fun and visual definition to function. I've tried without luck this morning to locate the Regency-era dress in the Victoria and Albert that features yellow silk stitching on a deep-colored ground: it's in Nineteenth Century Costume in Detail, an all-time favorite book. During subsequent years it will receive sprigged or swagged embroidery; right now the pattern is maturing in my mind. During the 1790s petticoats were still common, still worn with jackets or spencers or robes/open gowns. Many of the fashion plates that show what appear to be dresses are in fact made up of separate articles. Have a read of Gallery of Fashion or The Fashions of London and Paris at the Bunka Gakuen Library and this becomes abundantly clear. This petticoat is no different. I am making it up just like countless 18th century petticoats, early or late. While I use more panels than they did, because most of our silk comes in wider widths (in this case with two panels of silk shantung), the rest is normal MO: the panels seamed selvage to selvage with combination stitch, with a narrow hem at the bottom (ordinary for the period and conserving of fabric), and a waist stroke-gathered to cotton tapes that then tie around the waist and two pocket holes at either side built into the seams. The hemming is again ordinary for the period. No blind hem this, just a running stitch. Here is where the contrasting silk offers a little punch. Purple and yellow! Drops of sunshine on the lilacs. Here's how to make the stitches even. The sewing silk thread should be high quality. 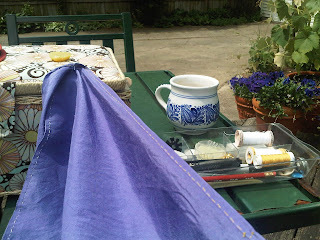 I am using Au Ver a Soie and the thread is waxed with beeswax (mmmm, good!) to prevent tangling and to help it slide through the silk. 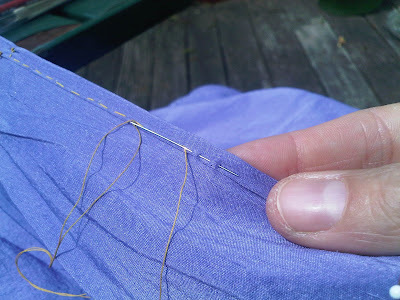 Example of the running stitch hem. Sew the fabric under tension, just as recommended in period texts (such as those gathered into The Ladies Stratagem. You could use a sewing brick, or pin the work to your knee, but I choose to pin it to my sewing box. Then stretch out the fabric taut, and turn the raw edge under perhaps 1/4 of an inch for a few inches, turn it under again, and press the hem flat with my fingers until it holds, and pin it for good measure. 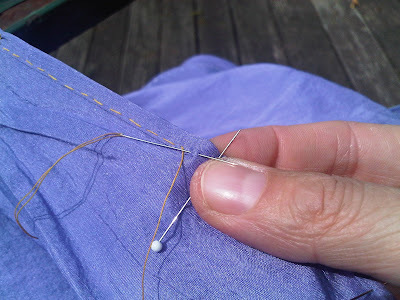 Then running stitch the hem those few inches, rocking the needle to gather up two or three stitches at once, and make sure that the stitches and the spacing between them are as even as possible, perhaps 12 stitches per inch. Running hems on downs of the era do not use the minute stitches used for shifts; one wanted to be able to pull out the hem to remake the garment later. Next turn under a few more inches to a hem, finger press it, stitch it, and repeat, ad infinitum until the hem is complete. The example image below shows two stitches gathered up. I pulled them out of course, but would have anyway. Why? Look at the middle stitch -- actually a space between stitches, where the needle shows. Do you see how much needle is showing? Is that space the same size at the stitches to either side? No. It's longer. Unh, unh. For a neat hem that is not nice: pull it out and do it over. Force yourself to be a somewhat OCD and you will be happy with that hem for years. Another example of the running-stitched hem. That's all for today! Doesn't seem much, does it? Each little bit to me is special, a small practice in ancient skills. Thank you! I bet you feel that way about your projects. It's enough to make me wish that yellow wasn't such a bad color for me! Your contrast hemming is very lovely and inspiring - perhaps I could do something other than yellow, when a get around to a project of this period...hm!